It was announced today that FOTA has temporarily suspended Williams from membership of the teams' organization. 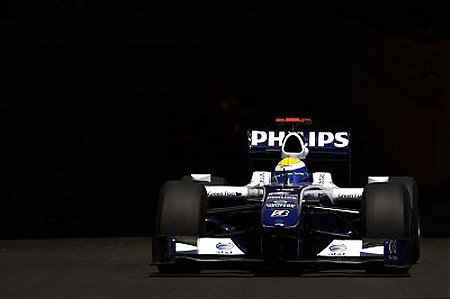 The reason is obvious - Williams has signed on for next year in spite of having agreed with all the teams not to do so. But we should not see this as a significant crack in the unity of the teams, although Mosley will paint it as such, no doubt. The position of both Williams and FOTA is completely understandable. Williams would like to be seen as continuing its support for FOTA's stand but feels bound legally to register its intention to participate in the FIA championship next season. The team exists purely to race in F1 and does not wish to flirt with the possibility of having nowhere to go therefore. FOTA's reluctance to suspend the team is apparent in that the action is "temporary", implying that Williams will be allowed to re-join at some future date. It seems that the action was necessary because the teams had been advised that entry to the championship would result in suspension - not to have carried through with the threat would have indicated weakness and encouraged others to break ranks too. So the suspension has been carried out in a very civilized manner, with all concerned regretting but recognizing its necessity. This is no lovers' tiff and has more of a flavor of "this hurts me more than it does you." In fact, Mosley can take little comfort from the news. Williams' decision has not started a stampede of teams to sign up before the deadline and rather highlights the fact that Force India and Brawn GP, usually seen as the teams most likely to blink early, are staying with FOTA for the moment. Like Williams, these two exist only to compete in F1 and so are the most vulnerable to pressure from the FIA. Their positions are slightly different, however. Force India is just a part of Vijay Mallya's empire and is more like Mateschitz's Red Bull and Toro Rosso teams in not being an essential hobby for its owner. And Ross Brawn's team is used to hovering on the brink of non-existence and knows how close to the edge it can go as a result. McLaren and Mercedes are staying quiet, obviously supportive of FOTA but needing to avoid being seen as a leader in FOTA's rebellion. Martin Whitmarsh's description of the team's role as peacemaker is a convenient disguise of what I do not doubt is McLaren-Mercedes' full agreement with FOTA's demands. So the Williams suspension is unfortunate but not the end of FOTA's resistance. A grid composed of Williams, USF1 and several beginner teams is no substitute for the F1 we know today. The omission of Ferrari would destroy the sport's viewing figures, that is certain, but if Renault, Toyota, Red Bull and Toro Rosso were to disappear as well, F1 would indeed become just another GP2. The sport has seen teams come and go and even great ones like Lotus, Brabham and Maserati have not proved indispensible. This is about quantity as much as quality, however. Surviving the withdrawal of Ferrari might just be possible but the simultaneous departure of five or more teams will leave F1 as a sideshow with little drawing power. Unfortunately, Mosley's confidence will be bolstered by Williams' decision as he remains certain that the teams will surrender in the end. We can expect him to resist the idea of dumping his new rules and starting again from scratch with assistance from FOTA therefore. No reasonable compromise is likely in the near future as a result and meanwhile the boards of the manufacturer teams are given plenty of time to decide that they have had enough. Several have been dubious about F1 anyway and this unseemly brawl may be the last straw. Mosley's silly power games cannot be allowed to continue, that is clear. There would be no argument had he consulted with FOTA before announcing new regulations and it is pride that prevents him from accepting that he will destroy the sport if he refuses to scrap his rules and start again. It has been obvious for some time that he does not have the interests of F1 at heart and is prepared to sacrifice the sport on the altar of his own ego. It is no accident that the cry of the moment is "Max out!" Three years is a really long moment. There is 3 parts, FIA, FOTA and on the sideline, FOM. I'm thinking, do they need FIA. Are there any chance that FOTA starts to talk with Bernie and convince him about FOTA is Formula1 together with him and FOM. They could then start racing without FIA. What are the contracts between FIA and FOM? Hezla: Generally, when we say "Bernie Ecclestone" that includes FOM and vice versa, since Bernie is the only personality in that faceless organisation that matters. FOTA is not seriously considering setting up a rival series (which is what your suggestion amounts to) because of the legal and logistical complications it would entail. For the moment, the fight remains one for the views of the teams to be taken into account by the FIA. Besides, I wouldn't sign a deal with Bernie - would you? Count your fingers after shaking hands on it if you would. Contracts between the FIA and FOM? None as far as I'm aware, apart from the fact that Mosley sold the FIA's commercial rights to Bernie who then sold them to various suckers, ending up with CVC. The two organisations have different areas of influence and frequently these are in conflict, at which point Max and Bernie have a chat and sort out their differences. OH!! All these old geezers, when are they going to learn? The future belongs to the new generations, both Max and Bernie have done all they should and more for F1, and some of it really good even, but now the time has comee to let go and let new faces take over. There's no idea to keep going just because youre afraid of loosing power, heck, they're probably dead in ten or so years, whats all the fuzz about? Who the hell wants to be rich and powerful if all you have is you're money? If the rest of your life is turned upside down and there's no joy in life. If Max likes to live a life without joy, let him have it, but i want my F1 as it is. DO NOT TOUCH!!! I couldn't agree more, Björn. And I say that as an old geezer myself!